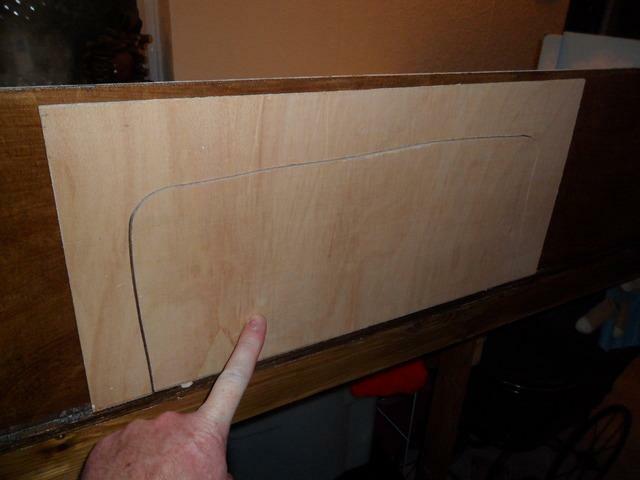 Today I've been working on the mechanism for making the ice skater skate on the pond. 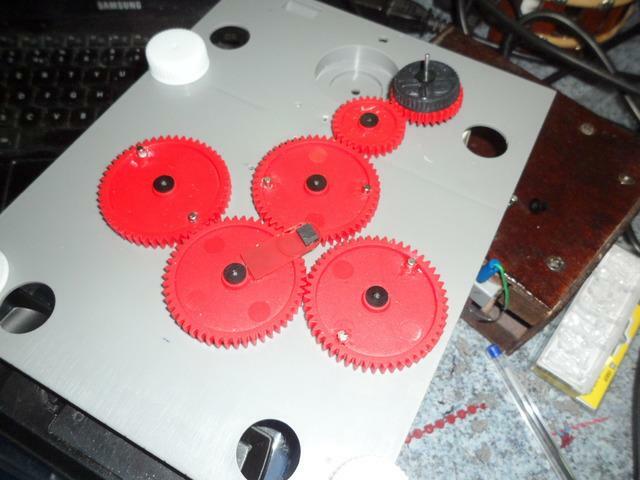 I used some robot cogs that I ordered off ebay. These where fixed to a sheet of plastic with holes drilled out for the spindles. I've attached some magnets. And I glue some metal (staples) to the bottom of the skates for the magnets to pick up. I also glues on some clear plastic discs to the bottom of the skates to keep the figures upright. The magnets didn't pick up the staples so well, but by adding some magnets to the bottom of the skates, these picked up better. I've now ordered some thinner magnets for the bottom of the skates. Here is a you tube test of it working. Faller actually came up with the concept with there motorized ice rink which is now discontinued. They also have some static ice rink models. So trying to purchased a working one is difficult and expensive. I just based mine on the same concept/principle. Plus if I build my own, I then can repair or replace any parts where the discontinued one will be very difficult. Thanks Kim, I don't want to take any credit for the mechanism, but It did take some doing to get it all to work. 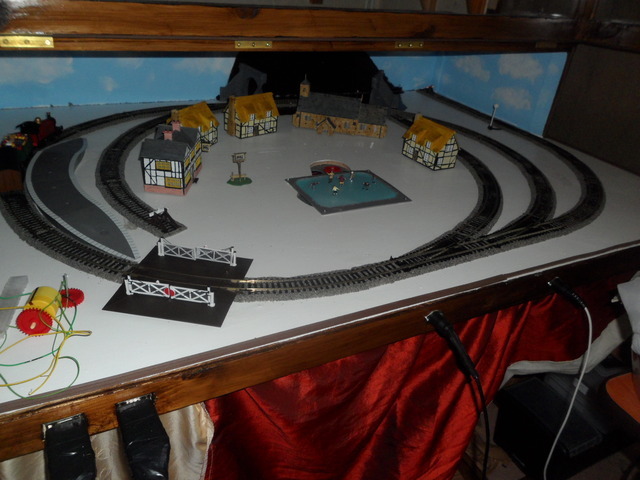 Today I've laid out the track again and the buildings. This allowed me to work out where the pond, the tunnel, point motors and electrical pickup wires are all going. 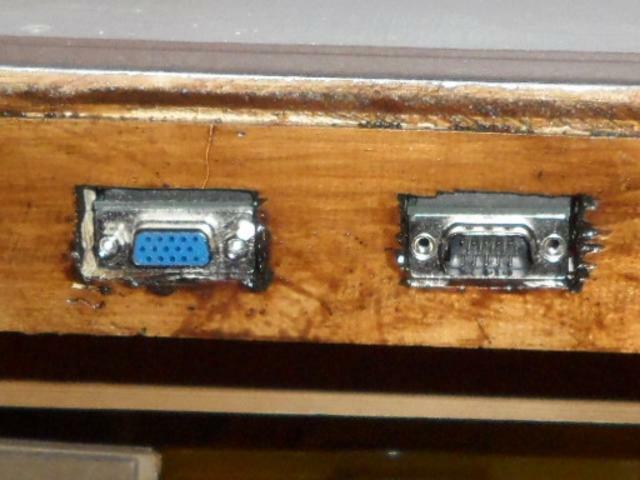 I going to cut a service hole in the back of the display case with a service door to access the tunnel. The pond will need to be cut out to fit the cogs. 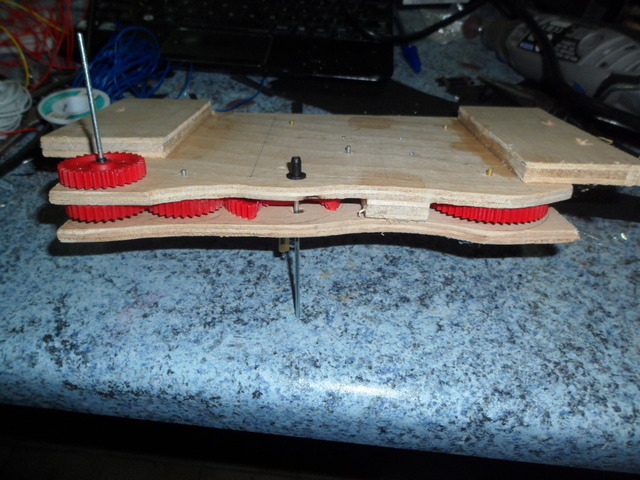 I will also need to drill holes for the electrical cable and point motors. I also worked out where the isolating fish-plates will be going to isolate some of the track, the sidings will be isolated to prevent the trains hitting the buffers and the points if set wrong (no disrespect to Jess, but I felt that some safety features was needed ) The gaps will be bridge with a diode to allow the trains to return in the opposite direction. The points will be also be self working, only allowing electric to run into the isolated section of the track if the points are set right. I've also marked the board where everything is going from the building to the track. I've got some more bits on order including some electrical wire. Nice one Roy. Did you make the girl twirl deliberately, or is it just the way it came out ? 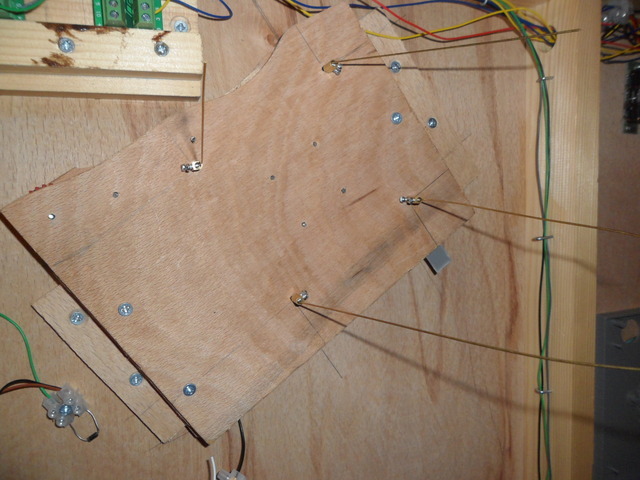 I've drilled out all the holes required in the base board for the wires and point motors. I also cut out a hole to accommodate the cogs for the ice skaters. This is now fixed in place and the pond ice on top. Any gaps will be filled and landscape with snow. 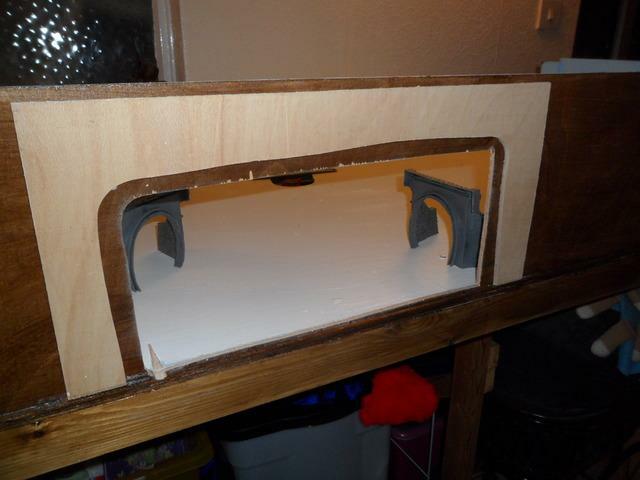 I also made a service hatch for the tunnel in the back of the scenery board. This will be held in place with some picture turns. 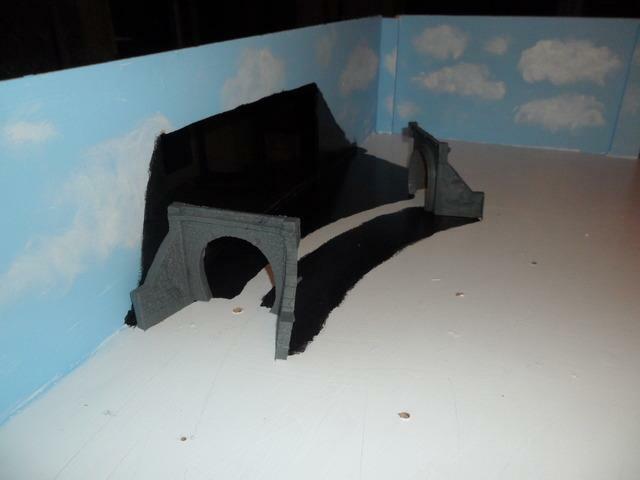 I've need to varnish the out side and I will need to paint black where the inside of the tunnel will sit. I've build a mini control box which I've wired up directly to the transformer. The other end I've solder on a 6 din plug and socket. The control box has three switches. Two of the switches isolates the power from each output in the transformer and the third is not connected to the transformer, but is connected to the 6 din plug which will allow me to isolate power from the board ie. to independently switch on/off an accessories from the board, ie a light running off a AA battery on the board. 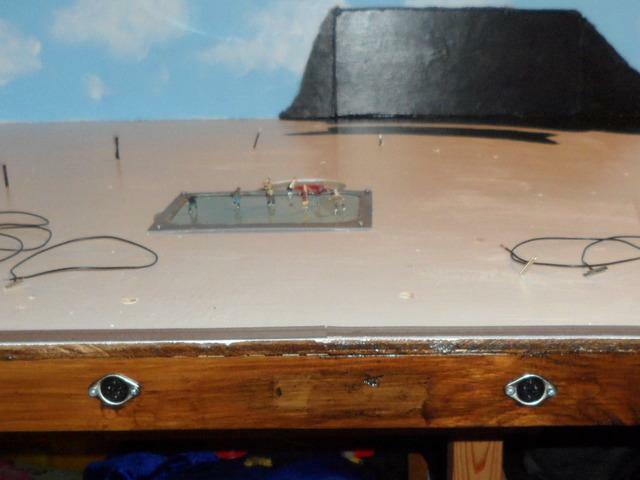 The one control box will be used for all the model railways layouts as well as my Faller fairground rides builds. By having the ability to independently switch off the power from each output will be more beneficial for my Faller fairground rides layout rather than the railways. I will be building a separate control box for the point motors and accessories. I also painted the board black where the tunnel will sit and I'm currently varnishing the outside of the tunnel service hatch and waiting for that to dry for it next coat, hence why the service hatch is not in place in the next photo. The last few days I worked out how I'm going to wire the layouts. I used colour codes wiring and terminal blocks which I numbered. From the information that I gathered from my plans, I built a control box for the points and accessories. 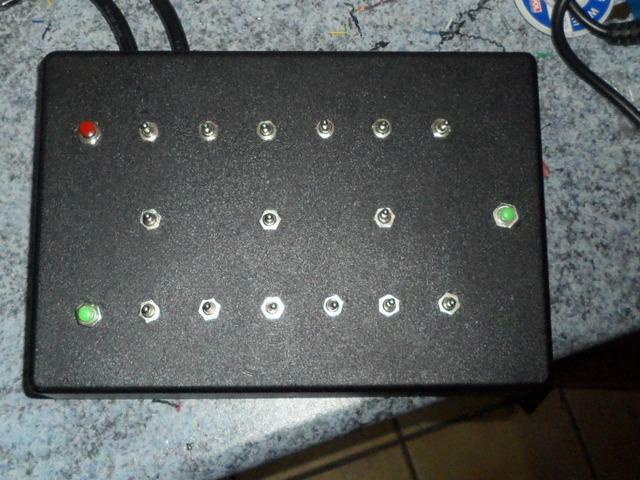 Because the control box will be used for my other layouts, it has 12 point switches instead of 3. 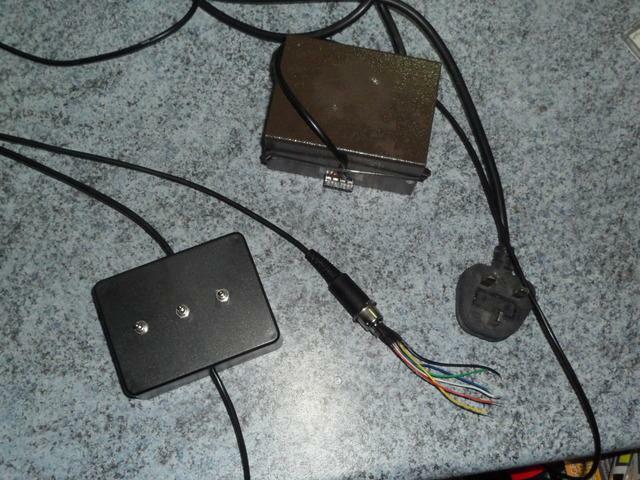 The control box also contains the CDU. Any semaphore signals can be operated from the point motor switches and any signal lights can be wired up to a point motor with a build in directional switch. 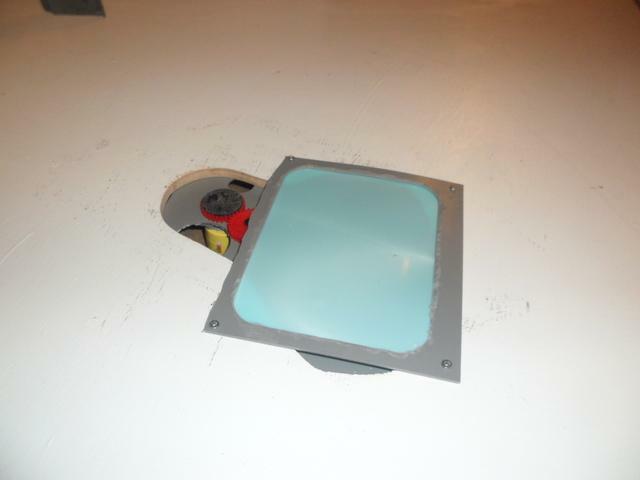 The picture turns were added to the tunnel service hatch. 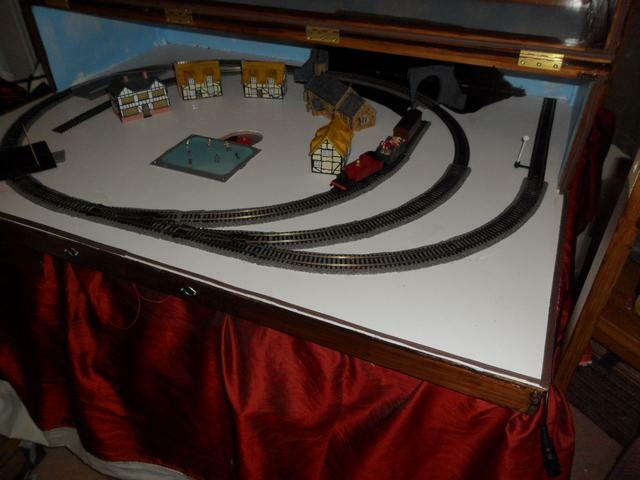 The actual train controllers were made at the beginning of this year and can be found on this thread. 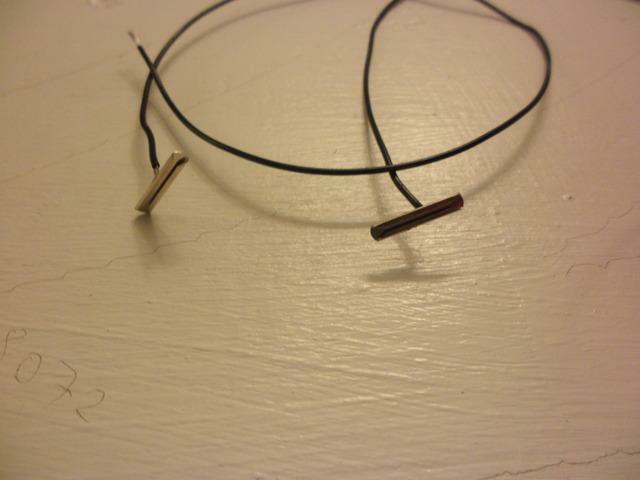 royjess wrote: The last few days I worked out how I'm going to wire the layouts. I used colour codes wiring and terminal blocks which I numbered. 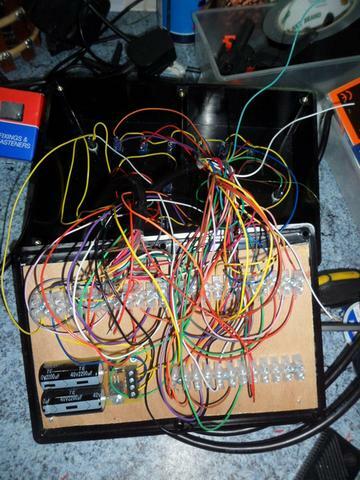 You're certainly doing a major wiring job on this lot to get all the parts to work independently and or together !!!! Sockets have been fitted both 6 din plus multi pin computer sockets. 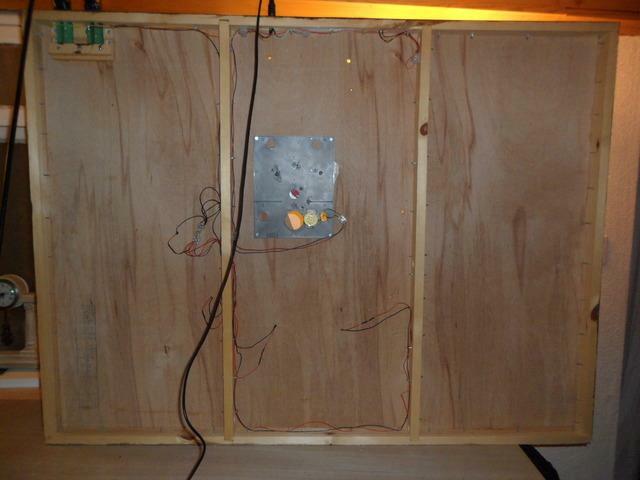 All the wire is neatly run underneath the board with the aid of the staples that I fitted to the base board frame during it's construction. I've also solder some wire to some fishplates to wire up to the controllers. So far all I've wired up is the skaters and some LED's for illumination. I've now run out of LED's so I've got more on order. The good news is that the control box is working as planned. A bridge rectifier was fitted to the LED circuit to change the power from AC to DC. Here is a you tube video of what I've got done so far. The wiring is pretty simple. If you can wire up a bulb to a battery then what you see on my layout is simply a multitude of the bulb to a battery circuits. I now moved the layout from the conservatory to the lounge. I've taken the top rack off my shelving to lower it so Jess can view it easily from her chair. 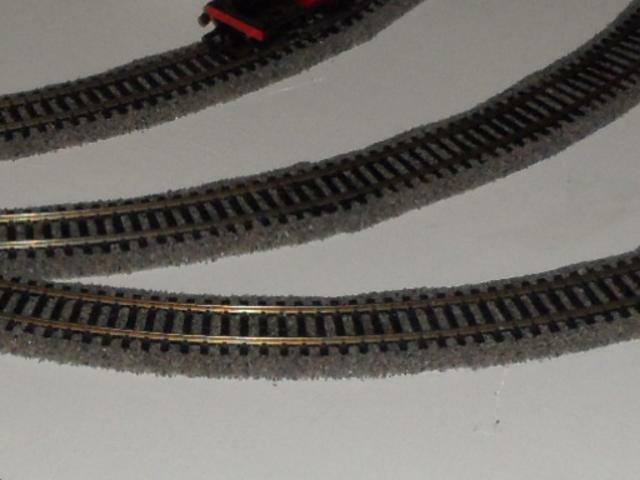 I've laid down most of the track using the Gaugemaster ballast encrusted underlay which is very deceptive. This took me around an hour to do and then the train was up and running straight after. No glue on the track to tend with or the ballast fouling up the points. Unfortunately I was a little short of the underlay so I've got more on order. On the photo it's very hard to see that ballast effect on the underlay, but I assure you it is there and you can't tell the difference from the lose ballast. More of the electrics was wired up and I'm now out of certain colour wiring and connector blocks, so again I'm waiting for more on order to come before I can do any more. With more of the wires now connected up, so far everything is working as it should be, especially the safety features that I've put in. 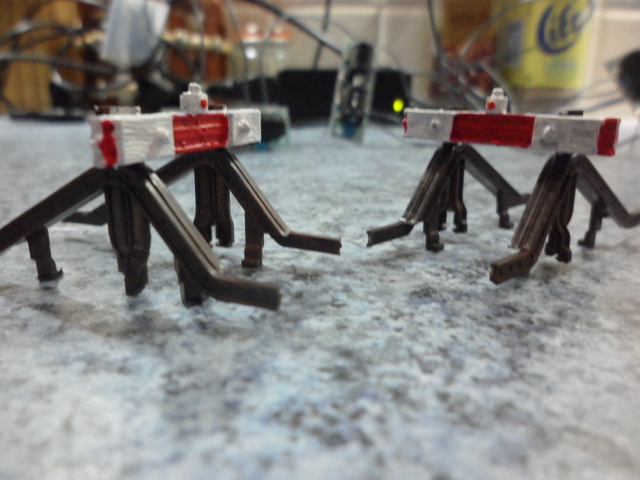 I've also built some buffer stops and painted them. I've two of each, but only need three. So not sure which ones I be placing on which sidings. I've also solder some wire to the point motors which will be wired up to the layout once the additional wires and connector blocks arrive. I've now completed wiring up the rest of the LED's for illuminating the buildings. I've also fitted and wired up all the point motors. The rest of the ballast underlay went down. 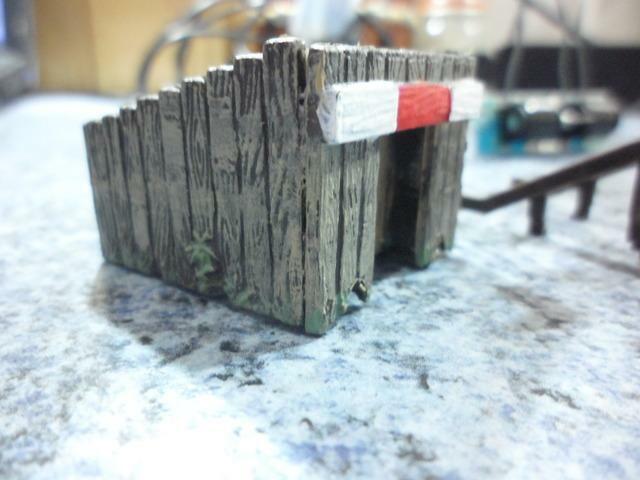 I made the mechanism for operating the Level crossing gates. 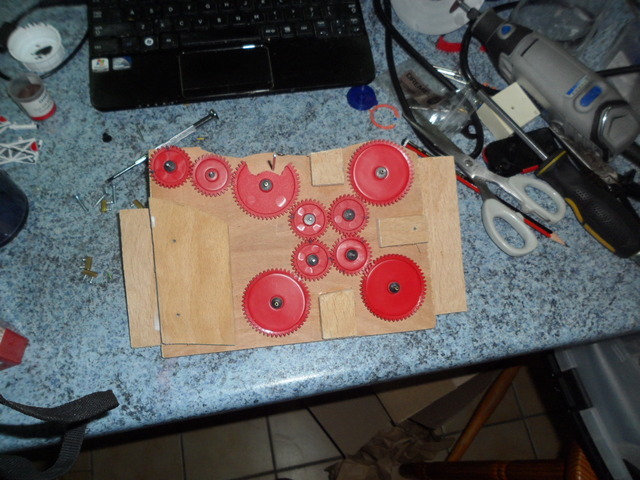 The large cogs were fitted with hollow tubing. 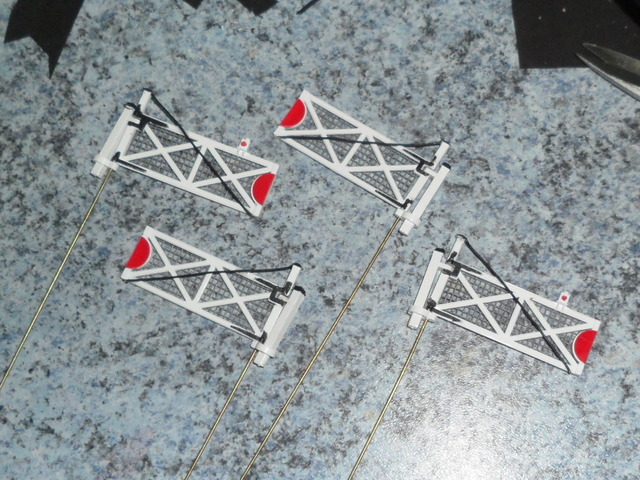 These will allow the gates rods to thread through. I'll be using the brass insides from inside of the block connectors to connect the rods to the cog spindles. I will be using a Faller AC motor without the reversing switch, so when there is some resistance in the motor, it will automatically reverse. The Peco gates were painted and modified with rods, supporting bar and grills. 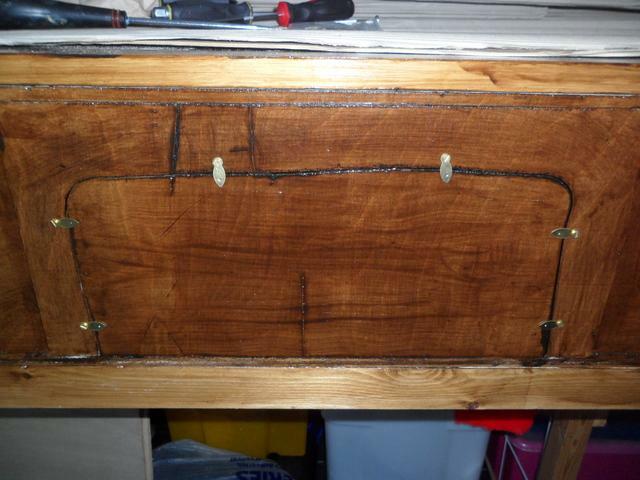 The mechanism fitted underneath the base board before I trim the rods. I've got the Level crossing gates working. I've decided to mount the motor above the board which means that I will need to cover it with either scenery or possibility of a signal box. You can see the Faller motor in action in the video just to your left. The directional switch has been removed and because it is AC, the motor aromatically reverse when it hits some resistance.